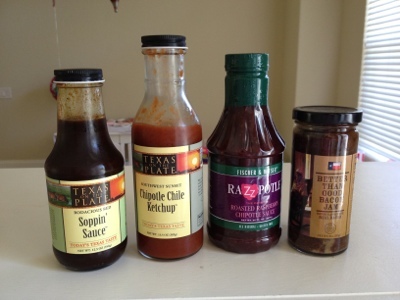 This month for Foodie Pen Pals I was paired with DeNise from Conroe, Texas and she sent me a little collection of some of Texas’ finest sauces to sample. First I tried the Soppin’ Sauce on my turkey burger, I cooked it in the skillet with a little sauce to keep it moist, I liked the flavor. Then a few days later I tried the Chipotle Chile Ketchup, I liked it, but I think it tastes more like a mild salsa than a ketchup. I haven’t tried the Razzpotle sauce yet, but I am planning on grilling myself up some salmon or grouper and giving it a taste. Lastly the Better than Good Bacon Jam, I am waiting for inspiration to strike and then I am putting it to good use. Thanks again to DeNise for a fun package of sauces from her state. If you are interested in joining Foodie Pen Pals click here and you will find all the details and registration info you need to participate. I’m going to take a little break from the fun with the impending new baby, but I’m excited to start back after a couple of months off. It’s so much fun shopping for others and receiving new things to try, you should do it, enjoy!